Фотобанк РОСФОТО - микросток. 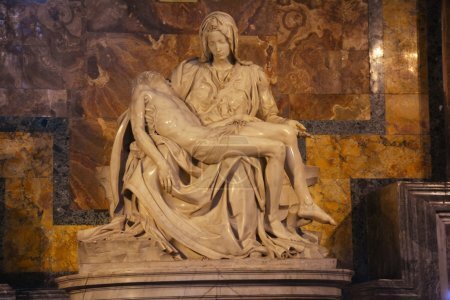 Лицензионные Фото, Видео, Музыка - The Pieta,St.Peters Basilica Vatican City,Rome Italy,November 5th 2013.Michelangelo's first masterpiece is inside St.Peters church.It is the only piece he signed because he was so young no one believed he sculpted it.A much see when in Rome. The Pieta,St.Peters Basilica Vatican City,Rome Italy,November 5th 2013.Michelangelo's first masterpiece is inside St.Peters church.It is the only piece he signed because he was so young no one believed he sculpted it.A much see when in Rome. Michelangelo's first masterpiece sits behind bullet proof glass these days because of a distraught person who took a hammer to it in the 70's.his work with marble is unbelievable and he makes the scene look so real.